Bottom line: The net effect of both the RNC and DNC appears to be a bounce from about 300 electoral votes for Obama to 322 electoral votes. That’s a pretty big bounce. By the way: Some of you might be wondering why I usually use Sam Wang’s forecast rather than all the others that are out there. The reason is that back in 2008 I ran a pool to predict the results of the election, and Sam was one of the co-winners. 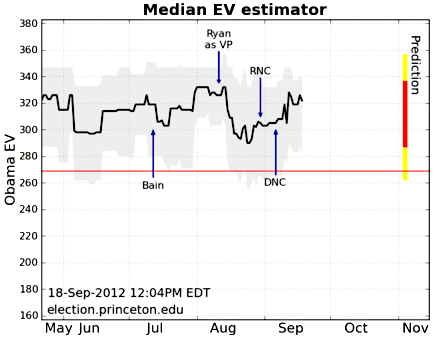 For now, then, I consider him the official election forecaster for this blog. This is, needless to say, a tenuous position, and requires him to predict really well this year too if he wants to hold on to this prestigious post. But that’s life in the free market, no? Red in tooth and claw and all that. For now, though, he’s top dog.